Shenmue Day: Join the Tweetathon! Since the tradition began in March 2012, Shenmue fans have been descending upon Twitter on the 3rd day of each month to tweet about this beloved video game series. Acknowledged by the announcements of both Shenmue III in 2015 and new versions of Shenmue I & II in 2018, the campaign now takes the form of a monthly celebration for fans to help promote the franchise and support its future growth. 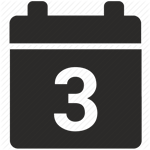 To join the party, simply tweet a message about Shenmue every 3rd of the month, sharing your love for the series. Retweeting others will also help maintain the community spirit that can only be experienced as part of the largest, longest-running routine social media event in gaming history! We are also on YouTube and used to be active on Google+ and Tumblr. For the very first time since its Dreamcast debut in 1999, the literally game-changing Shenmue has been released on new platforms. Coupled with the expansive Shenmue II, this enhanced re-release is now available on PlayStation 4, Xbox One and PC. Older fans and newcomers alike are now able to play the story from the beginning in time for the all-new third game currently in development. Shenmue I & II can be purchased physically with a double-sided poster and reversible cover, or digitally via Steam, PlayStation Network, and Xbox Live. These new versions, displayed at a higher resolution, offer outside of Japan both English and Japanese voiceovers as well as subtitles in a range of languages. The collection also benefits from modern control options and the ability to save anywhere. After fourteen years of uncertainty, Shenmue III was finally announced at E3 2015 with a Kickstarter campaign that would break two Guinness World Records. A subsequent publishing deal with Deep Silver has allowed the scope of this long awaited sequel to expand even further, ahead of its release on PC and PlayStation 4 on August 27th 2019. Legendary designer Yu Suzuki is back at the helm and joined by many of the original crew from the first two games, including music composer Ryuji Iuchi and both the English and Japanese voice actors for lead character Ryo Hazuki. Updates on the game's development can be found on the official website, with links also posted on Facebook and Twitter. You can also browse detailed information on the game in this Shenmue Dojo post. Crowdfunding for Shenmue III is now closed, however the game will be available digitally and at retail upon release, with many stores already taking pre-orders. In November 2014 we had the unique opportunity to interview the South Korean super fan wowing the Internet with his homemade recreations of Shenmue environments in HD. Within a year he would be recruited by Yu Suzuki to work on Shenmue III! In October 2016 we collated a series of discussions with Shenmue fan site chiefs past and present, seeking to understand what drove them to contribute in such a role and how they felt about it once Shenmue III was announced. In December 2016 we quizzed the designer of a proposed Lego set featuring Yu Suzuki, Ryo Hazuki, and several classic Sega arcade cabinets. The idea would attract the requisite following of 10,000 supporters to be considered for official release, but would be ultimately passed up by Lego. In August 2017 we sat down with the co-producer of Shenmue III to discuss his role as a fan of the series helping its continuation become a reality, and the need for its first two games to be made available to new players. In February 2018 we paired with a dedicated co-campaigner to revisit the topic of Shenmue III with its creator further into development. We also met a host of fans eager to see the original chapters re-released in time for the sequel. In August 2012, the now-archived 1UP.com pondered our initial campaign hashtag with friends in and around the games industry. In April 2013 a Sega fan site pondered the campaign's initial hashtag, prompting a clarification of our aims in response. In March 2014, with Yu Suzuki delivering a Shenmue Postmortem at GDC (and secretly meeting with Sony), we took questions from the G.E.E.K squad about the series and the campaign for Shenmue III. In April 2014, a British magazine ran a feature commending supporters of the campaign as an example to other gamers on social media. In August 2014 we were invited to deliver our campaign message to gaming podcast listeners directly, on the show that would later be renamed Out Of Lives. 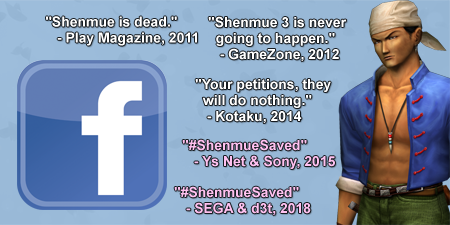 In December 2014 an American magazine plugged the campaign hashtag while listing Shenmue amongst franchises in need of a sequel. In December 2014 a Russian magazine plugged the campaign hashtag while featuring a fan-made mobile game based on Shenmue's Lucky Hit. In July 2015 we were credited for the campaign in a Kickstarter update for Shenmue III, allowing us to finally divulge the contents of a book pictured in the hands of Yu Suzuki. In August 2015 we were questioned along with Shenmue III's director and co-producer by a British magazine following the game's shock announcement. In October 2015 we answered queries from a Sega fan site to promote the campaign for new versions of Shenmue I & II and to address the media's reporting of Shenmue III since its announcement. In January 2016 (submitted the previous month) we shared our origin story with online readers of a mainstream British newspaper to promote Shenmue III's ongoing crowdfunding. In August 2017, the Italian branch of IGN harked back to the monthly routine of tweeting for Shenmue III, before looking ahead at the results. In August 2018, the American cousin of Eurogamer reached out to representatives from Team Yu, Shenmue 500K, Shenmue Dojo, and documentary A Gamer's Journey: The Definitive History of Shenmue. Please feel free to contact Team Yu by email or through our Facebook and Twitter outlets. Learn more about the history of these communities here.